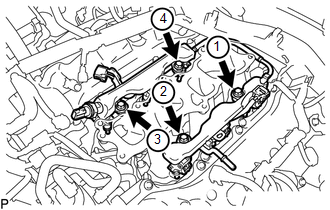 Perform "Inspection After Repairs" after replacing the fuel injector assembly (See page ). (a) Apply gasoline to new O-rings and install them to each injector. Check that there is no damage or foreign material in the groove of the injector when installing the O-rings. (b) Install the fuel injector assemblies to the fuel delivery pipe sub-assembly. Check that there is no damage or foreign material in the inlet of the fuel delivery pipe sub-assembly. Install the fuel injector assembly so that its stopper aligns with the positioning gap of the fuel delivery pipe sub-assembly. (a) Install 6 new injection vibration insulators to the intake manifold. (b) Install the 4 No. 1 delivery pipe spacers to the intake manifold. (c) Install the fuel delivery pipe sub-assembly (with fuel injector assembly) to the intake manifold. 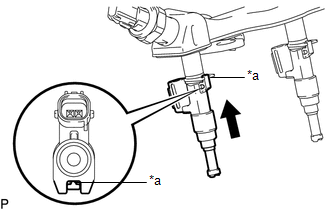 (d) Install the fuel injector assemblies to the fuel delivery pipe sub-assemblies with the 4 bolts in the order shown in the illustration. (e) Connect the No. 1 fuel tube sub-assembly to the fuel delivery pipe sub-assembly (See page ). (1) Connect the engine wire with the 2 bolts. (2) Connect the 13 connectors. (3) Engage the 2 clamps. (2) Connect the engine wire to the cylinder head cover sub-assembly LH with the nut. (a) Connect the No. 2 fuel tube sub-assembly to the fuel tube sub-assembly (See page ).